As seasonal cold weather finally settles over New England I’m feeling the urge to knit something warm and cozy but I’m not sure if I want a blanket, poncho, sweater or a pile of accessories! As I was thinking about what yarn I’d like to use I remembered our Valley Yarns Amherst, 100% Merino yarn with 2 dozen colors to choose from. Knowing that it’s 100% wool means that I won’t have to worry about a larger project sagging out of shape after time. Being Merino it will be nice and soft, and with lots of color choices I can fill in gaps in my wardrobe, or coordinate with my home decor. I don’t find wool to be too scratchy so I’m comfortable wearing it against my skin, I don’t own any pets, and I don’t mind hand-washing projects so this one seems like a great fit. After going through all the great patterns that are available for Amherst (and you can too by clicking the “Related Patterns” tab at the top of this page), I decided that what I really wanted was a new blanket for my favorite chair at home, and the Oatmeal Blanket is perfect. While it may look like a big complicated counterpane pattern it’s actually much easier! The whole blanket is simple triangles that are whip-stitched together. Super portable until the very end. Now I just have to decide on color. 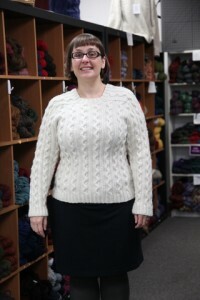 What’s your favorite project in Valley Yarns Amherst? 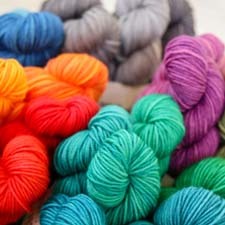 Valley Yarns Flash Sale is Here! 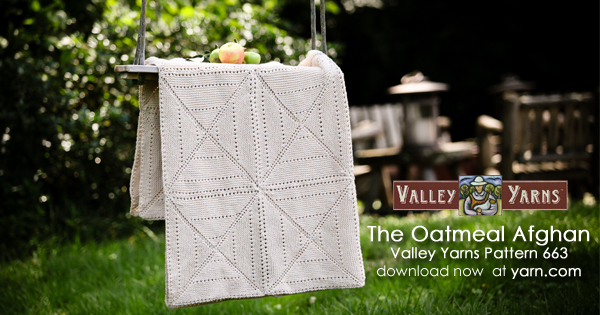 Are you a fan of Valley Yarns? Have you been meaning to try it for a while but just haven’t gotten around to it? Now’s the perfect chance during our Valley Yarns Flash Sale. 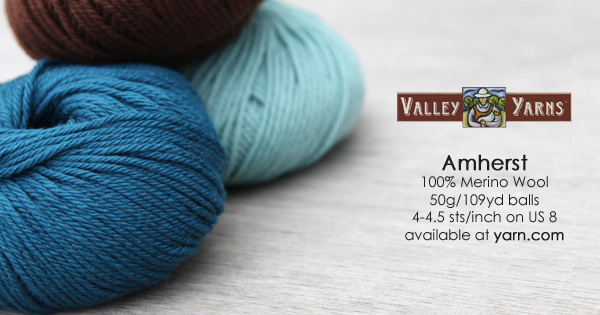 You have through October 6, 2015 at 11:59pm EDT to save 30% on Valley Yarns! Valley Yarns is our own brand that we source from all over the world. We look for beautiful yarns that will last, and strive to have them at affordable prices. You may want to take this chance to check out our two newest yarns, Valley Yarns Hatfield and Valley Yarns Sunderland. Both of these 100% alpaca yarns are super warm. Maybe merino is more your style? Take a look at Amherst. It’s one of my favorite Valley Yarns yarns because it is so soft. Prefer something without wool? Valley Yarns Southwick, Valley Yarns Longmeadow, and Valley Yarns Goshen are all wonderful cotton blends. I have a hard time knitting with cotton, but I must say, Goshen is one of my favorite yarns, and I’ve done several projects with it. If you’re hoping for something machine washable, we have three weights of Valley Superwash, Worsted, DK, and Bulky, that are sure to fit whatever project you are looking to make. I’m actually thinking about some quick accessories in Valley Superwash Bulky, since the weather turned a bit chilly over the last few days, and we have some great bright colors that we’ve recently added to the line. This is just a small sampling. No matter what Valley Yarns yarn you choose, you’ll love working with it. 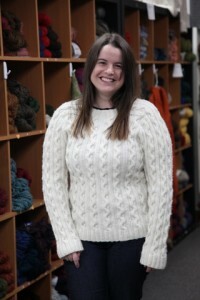 If you need inspiration, we also have a wonderful collection of Valley Yarns patterns designed exclusively for the yarn. Don’t forget, until October 6, 2015 at 11:59pm EDT, you can save 30% on your purchase of Valley Yarns. 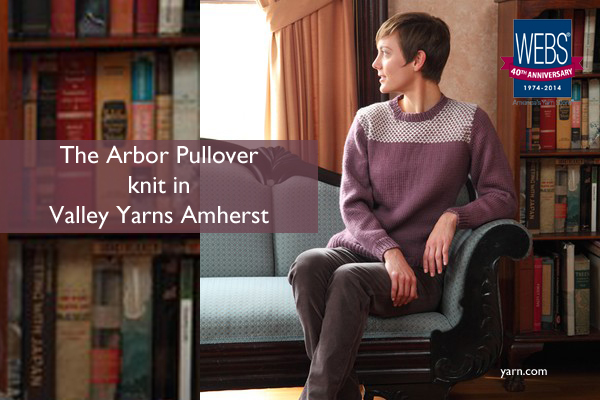 The Arbor Pullover, worked in valley Yarns Amherst, is a simple set-in sleeve pullover with a pop of texture at the yoke. With a classic crew neck, ribbed cuffs and hem this stockinette pullover could be boring and bland but the addition of a textured slip stitch pattern at the yoke livens it up and gives it a bit of polish. You could use two high contrast colors of Amherst as we’ve done for the sample or be more subtle and choose two tones of the same color like Balsam and Navy or Light Grey and Charcoal. Which colors would you use? 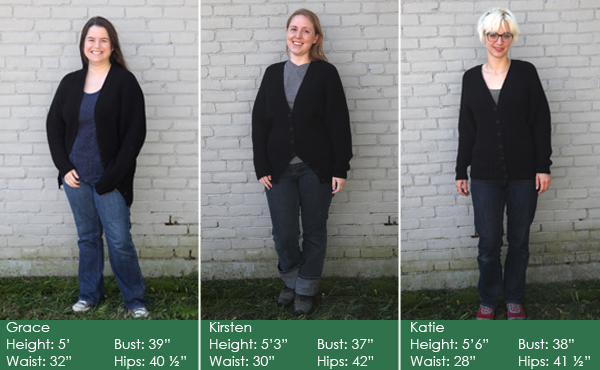 We have two more weeks of Valley Yarns Show and Tell posts for the Valley Yarns catalog, and this week we’re looking at 473 MoCA Cardigan. Easy garter stitch knit from cuff to cuff works brilliantly with a modern dolman sleeve shape and an unshaped, naturally draping neckline. 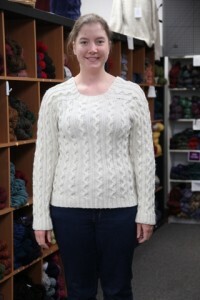 Soft and cozy Valley Yarns Amherst will make this design one of your favorites. We tried on the 36″ size. We were a bit split on the design of this cardigan, but all agreed that Valley Yarns Amherst is a super soft, super cozy yarn. 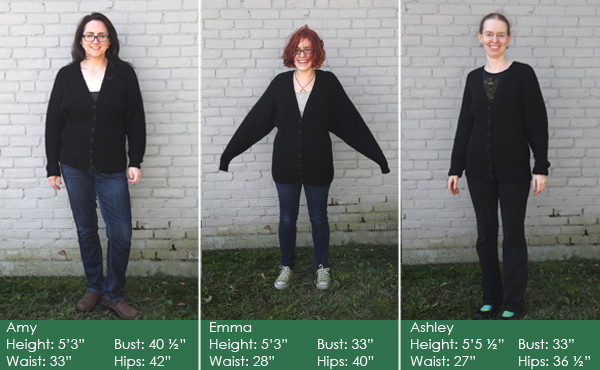 Many of us found the dolman sleeves to be too big and bulky for us, but the word “cozy” did come up quite a few times. You can check out the pattern here. In this week’s show and tell, we try on 421 Pearl Street Cabled Pullover. It is knit in super soft Valley Yarns Amherst. 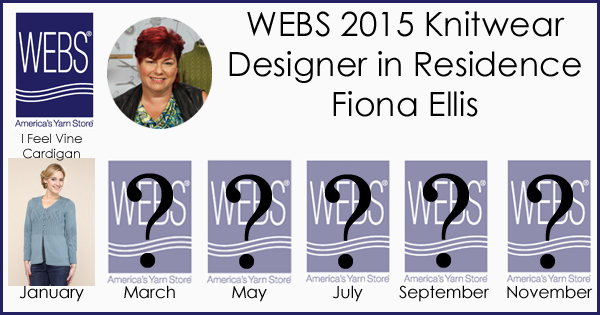 It’s knit in the round from the bottom-up with seamless, wide saddle shoulders and easy ribbon cables. Next week, we’ll be featuring 416 Dylan Cardigan.